The Cowboy State is home to some of the most stunning mountain ranges in the continental United States, two of the most widely visiting national parks (Yellowstone and Grand Teton), and public school districts boasting some of the nation’s highest testing students: Wyoming ranks 11th in the nation in both NAEP reading and math scores according to U.S. News & World Report. 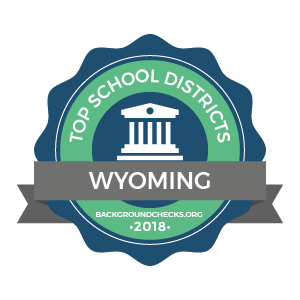 Wyoming’s best school district is Sheridan County School District #2, comprising six elementary schools, one junior high, one high school, and two alternative schools serving Sheridan, WY. The district’s students perform excellently in academics, leading the state among large districts in both reading and math. Ranking #2 in Wyoming is Sublette County School District #1, a small system of four schools serving several communities in its namesake county. As proof of the district’s high level of achievement, Pinedale High School was awarded a bronze medal by U.S. News & World Report, signifying its status as one of the nation’s best public high schools. Uinta County School District #6 ranks third among Wyoming’s school districts. According to Niche.com, the district boasts an impressive graduation rate of 85%. At #4 is Niobrara County School District #1, comprising four schools serving the totality of Niobrara County and part of Goshen County, followed by Lincoln County School District #2 (#5), whose schools are all accredited by AdvancED and the State of Wyoming.